Extend HDMI up to 165ft (50m) over Cat5e/6 cabling with a wall plate finish, and power the extender from a single power source on either side of the connection. The ST121HDWP HDMI over CAT5 Extender Wall Plate Kit lets you extend your HDMI audio/video up to 165 feet (50 meters) over Cat5e or Cat6 cabling. 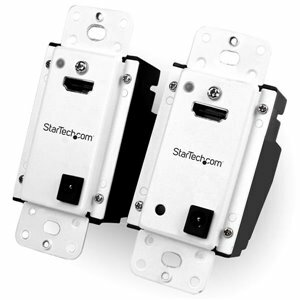 For a seamless, professional installation, you can install the included transmitter and receiver units into wall plates, with the added versatility of Power Over Cable enabling both units to be powered by the same single power source.Unlike some video extension systems, the ST121HDWP lets you make use of your existing Cat5 or Cat6 networking cable infrastructure, saving you the time and cost of running expensive proprietary cable. Plus, the kit includes both the extender and receiver, saving you the hassle of buying each component individually.With a sleek finish and wall plate housing, the ST121HDWP is designed with professional installations in mind. Offering a stylish integration into your modern boardroom or classroom, the HDMI extender looks great in any application that requires your equipment and cabling to be concealed from public view.The HDMI extender is great for both short and long-range applications. With a discreet installation the extender is perfect for boardrooms, restaurants, hotels, classrooms and lecture halls. Plus, because the ST121HDWP can extend your signal up to 165 feet (50 meters) over Cat5, you can achieve a total distance of 197ft using HDMI cables up to 5m (16ft) long at both the transmitter and receiver ends - perfect for long range digital signage applications.For installation flexibility, the extender offers the unique benefit of an optional external power adapter, giving you the option to power your extender externally for ease of installation, or internally with a 12V DC terminal to discreetly hide your power source.